New York, Pierre Matisse Gallery, Calder: Constellationes, May-June 1943. London, Mayor Gallery and Waddington Galleries, Calder, April 1981, p. 8 (illustrated). New York, Hirschl & Adler, Carved and Modelled: American Sculpture 1810-1940, April-June 1982. St. Louis Museum of Art; Honolulu Academy of Arts; Boston, Museum of Fine Arts, The Ebsworth Collection: American Modernism 1911-1947, November 1987-June 1988, pp. 64-65 and 200, no. 10 (illustrated). Washington, D.C., National Gallery of Art; San Francisco Museum of Modern Art, Alexander Calder 1898-1976, March-December 1998, p. 201, no. 165 (illustrated in color). Washington, D.C., National Gallery of Art; Seattle Art Museum, Twentieth-Century American Art: The Ebsworth Collection, March-November 2000, pp. 64-65 and 279, no. 8 (illustrated in color). Seattle Art Museum, Alexander Calder: A Balancing Act, October 2009-April 2010. D. Bourdon, Calder: Mobilist/Ringmaster/Innovator, New York, 1980, p. 85 (illustrated). Art in America, vol. 73, no. 7, July 1985, (illustrated in color on the frontispiece). J.-C. Marcadé, Calder, Paris, 1996, pp. 104-105 (illustrated in color and illustrated in color on the cover). J. Baal-Tefhuvia, Alexander Calder, Cologne, 1998, p. 24 (illustrated) “Alexander Calder: Working with Volume,” Scholastic Art, vol. 30, no. 3, December 1999-January 2000, pp. 6-7 (illustrated in color). D. Ngo, ed., Art + Architecture: The Ebsworth Collection + Residence, San Francisco, 2006, n.p. (illustrated in color and installation views illustrated). 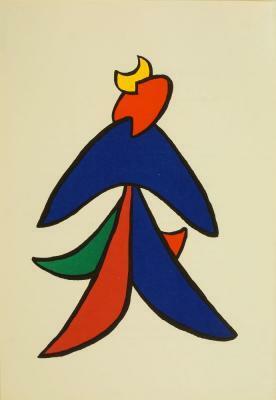 A. Pierre, Calder: Mouvement et Réalité, Paris, 2009, pp. 197 and 199 (illustrated in color). 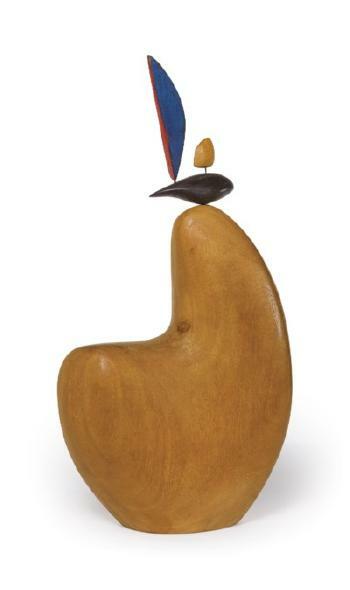 New York, L & M Arts, Tinguey, Calder: Between Surrealism and Abstraction, exh. cat., 2010, p. 142 (drawing illustrated).